Co-funded by the Charles Léopold Foundation for the Progress of Humankind and the European Commission (DG Employment, Social Affairs and Equal Opportunities). Download English version, PDF format. This book was written to be read by all who are concerned by the profound challenges facing our society and the way in which economic actors both lie at the origin of these problems and can provide solutions to them. It draws on the results of two studies. * The first study was run by several researchers based on five continents (Africa, Asia, North and South America, Europe) - cf. EASR Study. They are, with others, members of the WSSE EASR Workshop ; various parts of their research are reproduced in this document. * The second study was run by the Ecosol association (providing back-office support for the WSSE) and co-funded by the European Commission and the Charles Léopold Mayer Foundation for the Progress of Humankind. The book does not set out to be an exhaustive compendium of every type of responsible action undertaken by businesses and other economic actors. Rather, its intention is to contribute to shedding light on the situation and highlighting a number of examples that can serve to motivate readers to take action themselves, at their own level and in their own space. The "avenues for the future" set out at the end of the book are intended to be of help to readers in this. 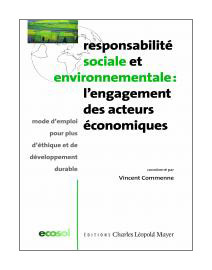 Economic Actors’ Participation in Social and Environmental Responsibility - A Guide to Promoting Ethics and Sustainable Development is available in French, English and Spanish.